With Portland being named the No. 1 city in the world for craft beer, it’s no surprise that Maine is home to some pretty darn good breweries. Maine continues to rank among the very best in the world across many publications. D.L. Geary Brewing Company helped to launch Maine’s craft beer movement in 1986 with their signature pale ale. Since that time, over 75 breweries have sprung up across the state. Here are our 10 favorites. Allagash Brewing Company is New England’s oldest Belgian-style brewery located in Portland. Allagash started as a one-man operation in 1995 and has since grown in one of Maine’s largest breweries. The brewery is open seven days a week for free tastings, tours, and retail. Tours must be reserved through the website. Opened in December 2013, this microbrewery has exploded in popularity in the past few years. People from all over New England wait in line for hours to snag a six-pack of their flagship beer, the Substance Ale, and other cans. Now located in the new Thompsons Point, the tasting room is open Wednesday through Sunday. Atlantic Brewing Company started as a one-barrel operation in 1990 in the popular Lompoc Café in Bar Harbor. As demand grew so did the brewery. While the brewery brews delicious craft brews throughout the year, the brewery tasting room is only open May to October. They may also be open for special events in their offseason months. Don’t miss their Blueberry Ale! Maine Beer Company is one of Maine’s largest breweries with their tasting room offers samples of eight different beers, including some brewery-only releases. The brewery has a wide selection of styles so you’ll easily find a beer to satisfy your taste buds. Rising Tide Brewing is a small-scale, family-owned brewery in Portland’s East Bayside neighborhood. They specialize in artisanal, hand-crafted ales like Daymark, Zephr, and Ishmael. Food trucks and live music can often be found at their tasting room. Marshall Wharf Brewing Company in Belfast produces 17 different draft lines, including several seasonal brews. The beer can be found on draft throughout the state and the brewery is the house brewery for Three Tides. Stop in the brewery and get your growler filled with popular favorites like Illegal Ale-Ien and Weisse Grip Hefeweizen. Orono Brewing Company is the love child of Brewmaster Asa Marsh-Sachs. He combines the art and science of brewing to create some of Maine’s best tasting beers. If you’re an IPA lover, then you’ll love the Tubular IPA and Dr. Quince IPA. Oxbow Brewing Company is an American farmhouse brewery in Newcastle and Portland that specializes in traditional Belgian-style ales. 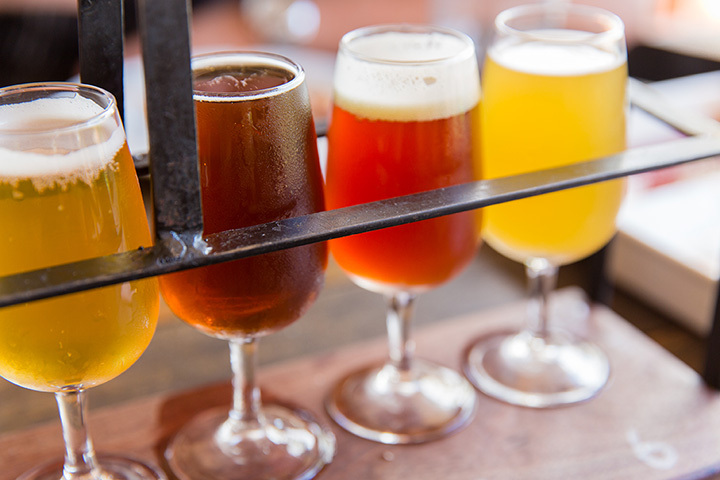 Beers are brewed in small-batches and can be found throughout the Eastern Seaboard. Popular ales include the Farmhouse Pale Ale and Oxtoberfest. Tastings are available in both Newcastle and Portland. Baxter Brewing Company is the first brewery in New England to can all its beers. Located in the Bates Mill in Lewiston, their brewery features a tap room, in-house retail shop and tours and tastings as special events. Nothing is more Maine than drinking a craft brew with a moose on the can. Funky Bow Beer Company started as a father and son story and now is a growing microbrewery and pizzeria in Lyman. With funky can designs and a great taste, you’ll love the beers from Funky Bow Beer Company. The G-String and So Folkin’ Hoppy are available year-round and quite popular on the farm. View more Maine Breweries and Brew Pubs.